This multimedia has NO radio function because the original radio will still work after install this multimedia. Warranty: After receiving the product you have 14 days right of return and the warranty period is two years! We only sell original, tested and top quality products! Just buy with confidence. the great product with the original packaging and the purchase receipt / warranty certificate. Still doubt whether the new radio in your car fits perfectly? No problem. Send us the information about the exact car model and year of manufacture of your car and, if possible, a photo of your original car radio by SMS / WhatsAPP (see number above) or by e-mail. Our technician will check your information right away and we will let you know immediately if the new radio fits perfectly in your car. If not, we recommend another suitable radio. - Steering wheel can control original radio only. 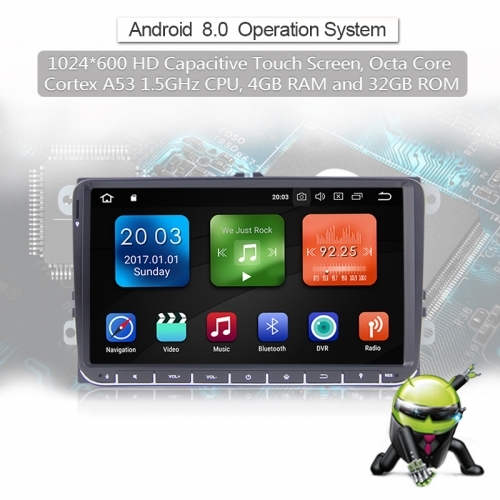 - This multimedia has NO radio function because the original radio will still work after install this multimedia. - If you are not sure whether it fits your car, please send pictures of your car's dashboard to us for confirming. - Support Smart Phone hotspot IOS9.1, Android 5.1 system. - Support 3 way output: built-in Wi-fi dongle,3G dongle(Optioanl). - Support TPMS built-in or built-out (Optioanl choose), Wifi-OBD II(Optioanl).